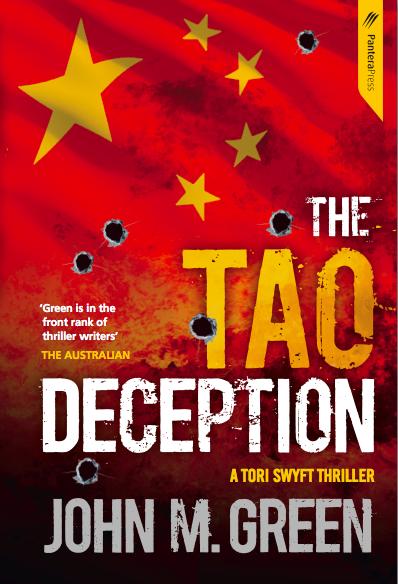 The Tao Deception is the second novel to feature Australian ex-spy Tori Swyft although it can easily be read as a stand alone. Packed full of action and danger and the occasional one-liners, this eco-political thriller powers along at a great speed of knots. Drones? Check. Spies? Check. Hackers? Check. Oh, and another bonus, my favourite character from Born to Run - Davey - is back for a few pages. He's the deaf son of President Isabel Diaz, the main character of Born to Run who also makes an appearance here. 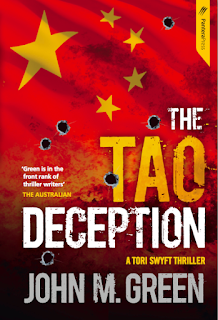 If you like the writing style and running gun battles of Matthew Reilly or the spy thrillers of Robert Ludlum, then you'll love The Tao Deception. The book is being promoted as The Da Vinci Code meets James Bond and I don't disagree. Tori Swyft is the female James Bond. It's not my usual genre, but The Tao Deception certainly kept me entertained. I'm in the process of interviewing the Sydney based author John M. Green for Boomerang Books at the moment, so stay tuned for that. In the meantime, please enter below to win a copy of The Tao Deception for yourself or a loved one. You're very welcome Mary and good luck! Thanks for your support Brenda. You say, "Tori Swyft is THE female James Bond." Love it! Tori and I thank you for such a great review, Tracey. Can Tori enter the freebie competition? Thanks John, you and Tori are very welcome. I don't currently have a rule against characters entering my giveaways, but perhaps I should? Hehehe, I'll keep an eye out. Thanks for your entries, this giveaway is now closed. Stay tuned for the announcement of the winner.